Repairs to a pothole caused hours of traffic delays on the M1 in Leicestershire. Two of three lanes were closed on the southbound carriageway of the motorway between junctions 23 and 23A for much of Wednesday. Jean Bryden wrote on the BBC East Midlands Facebook page the condition of motorways was "shocking... a serious accident waiting to happen". The lanes reopened just after 16:00 GMT, Highways England said. Phil Marshall posted: "Just managed to dodge that hole this morning, it was carnage with 6 cars on the side of the road with blown drivers side tyres." A Highways England spokeswoman said the condition of the road was "exasperated" by heavy rain the night before and required immediate repair. "We appreciate the impact the work had on journeys and thank people affected for their patience," she said. The southbound entry slip road at junction 23A was also closed to stop the flow of traffic on to the motorway. Traffic was diverted to the A42 towards Ashby-de-la-Zouch. Some motorists tweeted their frustration at authorities for not repairing the pothole sooner and during the night, while others backed the decision to swiftly take action. Ms Bryden posted: "The condition of motorways is shocking, not only the M1. A serious accident waiting to happen. Highways England need to get on it." 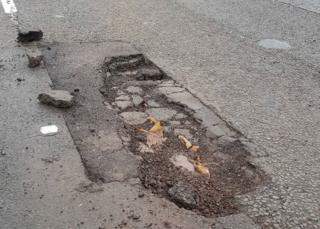 V Angelo Didonna also wrote: "About time... that pothole has been there at least 3-4 months... shame on you... we do pay road tax... where does the money go?"